Silver Intervals for Long Section Main Mine Area. Silver Equivalent Intervals for Long Section Main Mine Area. 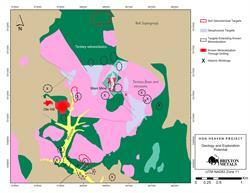 Geology map and mineralized zones of interest at Hog Heaven. 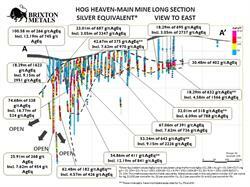 VANCOUVER, BC--(Marketwired - January 15, 2018) - Brixton Metals Corporation (TSX VENTURE: BBB) (the "Company" or "Brixton") is pleased to provide an update on its Hog Heaven project data review and project development plans. *Silver Equivalent values (AgEq) were calculated using the formula AgEq = $1,200 x Au g/t ÷ 31.104 + $17 x Ag g/t ÷ 31.104 + $3 x % Cu ÷ 100 x 2204.63 + $1 x % Pb ÷ 100 x 2204.63 + $1.20 x % Zn ÷ 100 x 2204.63/$17 x 31.104. This method assumes full metal recoveries. Metal prices used in this calculation include: $17 per ounce for Ag, $1200 per ounce for Au, $3 per pound for Cu, $1.2 per pound for Zn and $1 per pound for Pb. ** These intercepts have incomplete assay data for Cu, Pb and Zn. True widths cannot be verified at this time. 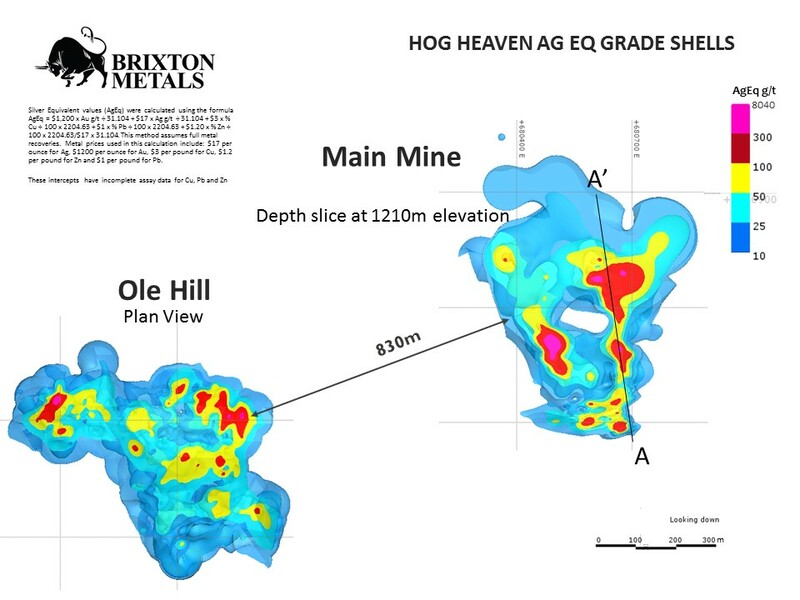 Chairman and CEO of Brixton, Gary R. Thompson stated, "We are discovering that the Hog Heaven project is a real gem as we dig into the historic data and are very encouraged by the degree of high grade intercepts we have encountered thus far. One of the holes ended in 3 percent copper at about 300m depth. In addition to the treasure trove of drill data, many precious and base metal targets as both near surface and feeder zone or root zone type targets have yet to be drill tested. Re-logging and sampling of select historic holes and geophysical surveys are planned over the winter months to gear up for drilling in the spring". 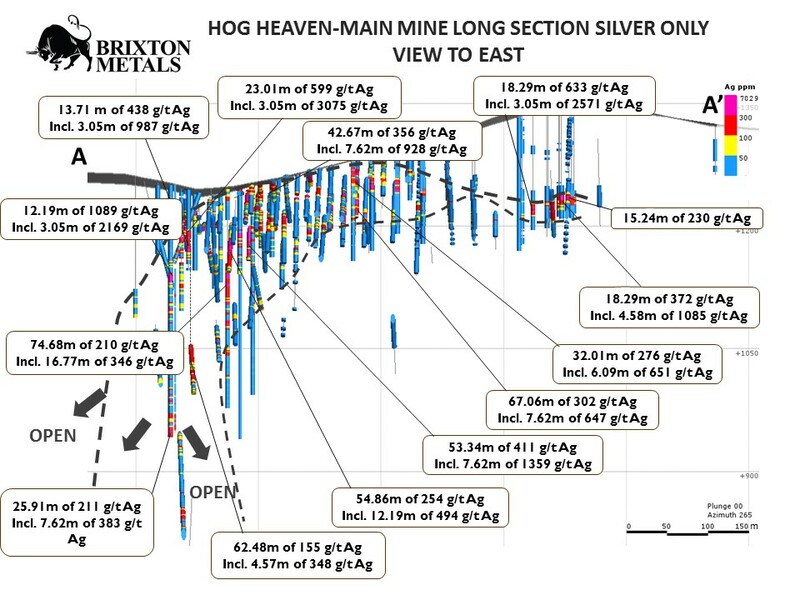 Drilling Data: Brixton has completed the assay data entry and half of the drill log data entry for the Hog Heaven project. Total metres historically drilled on the project is 57,498m from 722 drill holes as rotary, reverse circulation and diamond drill core. Interestingly, while all of the holes were assayed for silver and most of intervals were assayed for gold with the exception of one hole, 68 percent of the intervals were not assayed for copper and 34 percent of the intervals were not assayed for zinc and lead. The Plan and Long Section Maps at the links below plot the two mineralized zones where most of the drilling has been conducted, the Main mine zone and the Ole Hill zone. Generally, drill depth is fairly shallow and only a few deeper holes were drilled at the Main zone. At the Main mine 40,775m have been drilled with an average drill hole depth of 121m with the deepest hole to 509m. The total number of drill holes at the Ole Hill zone is 380 with an average depth of 43m with the deepest hole to 583m for a total of 16,456m of drilling. Mineralization remains open in several directions and at depth. Most of the drilling was completed as vertical holes to define the near surface mineralization. 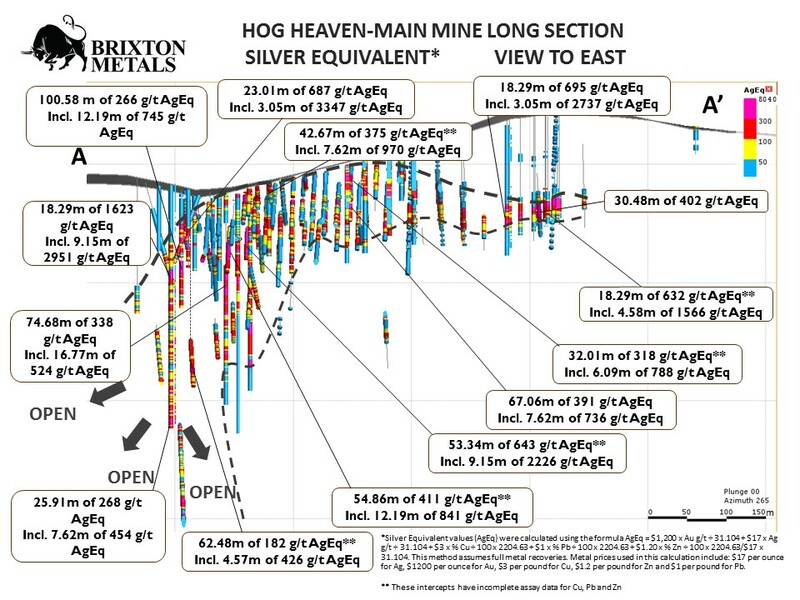 Hole AOR- 81-86 at the Ole Hill zone intersected 3.05m of 400 g/t Ag or 481 g/t AgEq within 13.72m of 167 g/t Ag or 205 g/t AgEq from surface. Note: The Qualified Person ("QP") for Brixton cannot verify the drill results reported in the tables above or the other technical information set out in this news release. The precise location of the drill cores from the program is presently unknown and they have not been inspected by the QP, and therefore Brixton has not undertaken any re-logging, re-sampling or check assays; however, Brixton has no reason to doubt the results and considers the results relevant and suitable for disclosure. Data from the above drill results are historical results and it is unknown what type of quality-control programs were performed at the time. The QP also advises that true width of the above results cannot be determined at this time. 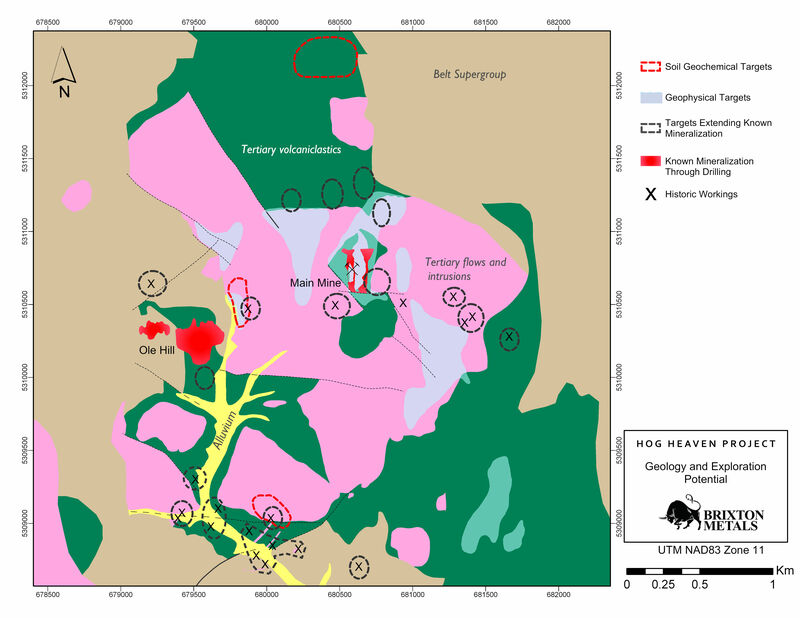 Geology Summary: The Hog Heaven Project is located in a field of Oligocene (30.8 - 36 Ma) volcanic and volcano-sedimentary rocks knows as the Hog Heaven volcanic field. The volcanic rocks consist of high potassium dacite-rhyolite flow domes and dykes, ash flow deposits and volcaniclastic rocks. These rock types intrude or unconformably overlie a basement of Late Proterozoic Belt Supergroup strata. The volcanic suite is comprised of a flat to gently inclined volcanic sequence, including a basal ashflow tuff unit, pyroclastic and epiclastic rocks, intrusive and extrusive dacite porphyry, diatremes and a late trachyandesite flow. Dome and dyke emplacement as well as Ag-Au-Cu-Pb-Zn mineralization was controlled by northnorthwest, northeast and northwest-trending extensional faults and fractures. Mineralization is also localized by permeability contrasts, such as the steep, north-trending diatreme breccia-dacite porphyry contacts, within flat-lying permeable pyroclastic and epiclastic units and along the contact between Belt strata and overlying volcanic rocks. Highest grades occur within zones of intense silicification and acid leaching. Mineralization styles include breccia-hosted, replacement, veins and stockworks as well as open-space fill. There is a strong vertical and lateral metal zonation with increasing Au-Cu grades at depth. Within flat-lying ore bodies, a core of Ag +/- Au is haloed by Pb and Zn +/- Cu. Alteration is characterized by acid-sulphate, with widespread argillic and advanced argillic alteration and vuggy to massive silicification. Mineral deposits at the Hog Heaven project are classified as Ag-rich high sulphidation type. Geophysical Surveys: Historical ground magnetics, VLF-EM, IP and gravity surveys were completed and the company is in the process of digitizing and reprocessing of these data sets. Planned work includes a deep IP-resistivity and LIDAR survey. The magnetics-VLF-EM and LIDAR survey are expected to help identify structures that may control mineralization and vector new zones of mineralization. The IP geophysical survey should image the known sulphide and siliceous resistive zones and potential expansion area drill testing. Planned Drilling: The focus for the initial 10 holes planned for the spring of 2018 shall be to twin and confirm some of the previous drilling and to test the high-grade feeder zones to the west of the Main mine zone and south of the Ole Hill zone. Phase two drilling will focus on expanding the known mineralized zones, infilling areas of sparser drilling and testing some of the nearby compelling targets. Additional holes will test newly generated targets. Quality Assurance Quality Control: Brixton has completed assay data entry for all of the drill holes and has developed the first 3d model for the project. The Company plans to collect and submit the previously drilled intervals that were not assay for base metals and analyze for the full suite of elements. In addition a select number of check assays will be analysed for comparative purposes according to industry standards. Ongoing work includes completion of the drill log data entry and a re-logging campaign of select cored intervals is planned. Brixton is also working with a qualified engineering firm to convert the mine grid based historical drill data to Universal Transverse Mercator (UTM) coordinate system. Permitting: The Company has submitted an initial drill plan to Montana Department of Environmental Quality. Brixton has posted reclamation bonds in the amount of USD$120,000 for its planned exploration drilling and for the transfer of the existing Operating Permit (inactive) from the previous operator. Resource Estimates: The Hog Heaven project does not have a NI-43-101 compliant resource estimate. The first significant milestone for the Company will be to establish a maiden resource on the project. The Company shall engage one or more Qualified Person's as defined by the NI- 43-101 to author a report when it believes it has completed enough work to provide a resource statement with enough material to generate a positive preliminary economic assessment report. Other Exploration Targets: In addition to the Main mine and Ole Hill targets, nineteen historic adits and workings have been identified within the area (see geology map at link above). Two of the prospects occur at the contact between the Tertiary intrusive and volcaniclastic rocks, similar to the Main mine. Three of the prospects occur in the Late Proterozoic Belt Supergroup rocks which Mauk (1983) believed to be part of the Revett Formation of the Ravalli Group. Three large gold-silver-in-soil geochemical anomalies have been identified by previous operators. Two of these remain to be drill-tested and the third has only been tested locally. The northern soil anomaly is located about 1.3 km north of the Main mine area and is underlain by Tertiary volcaniclastic rocks. The southern soil anomaly is located about 1.7km SW of the Main mine area and is located near the contact between Tertiary intrusive and volcaniclastic rocks. The Central soil anomaly is located 200m NE from the Ole Hill area and is underlain by Tertiary intrusive rocks and volcanic flows which also have a corresponding geophysical target. Eight geophysical targets have also been identified within an area of 3km by 1.5km. These targets have been defined primarily by magnetic lows occurring along the margins of gravity lows, where one of the targets cover the Main mine area. These targets have a northwest trend coincident with the orientation of a northwest trending interpreted graben structure, thought to control the emplacement of dome complexes and mineralization. Metallurgical Work: The Company is planning to undertake additional work in order to confirm and expand on the historical metallurgical studies conducted at the Hog Heaven project by the previous operators. During the phase 2 exploration program, two holes for metallurgical studies are planned. Artificial Intelligence (AI) and Machine Learning: Brixton is adopting AI and machine learning as part of its ongoing exploration efforts to more rapidly and efficiently advance its exploration projects. We anticipate that by utilizing these platforms we can mitigate exploration and development risk and build confidence in our targets and increase our chances of success while reducing costs. To that effect, the Company is planning to work with a number of highly regarded consultants to fully integrate the wealth of geophysical, geological, geochemical and drilling information available for the Hog Heaven project. The property is located in Flathead County, 55 miles south-southwest of the town of Kalispell, in the northwest portion of the state of Montana, USA. The property is easily accessible by driving 10 miles of gravel road from a highway. 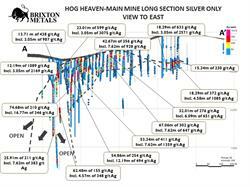 The Hog Heaven mine historically (1928 - 1975) produced 6.7M oz Ag at an average grade of 29 troy ounces of Ag per ton, 3,000 oz Au, 23M lbs Pb, 0.6M lbs Cu from 230,000 tons and an additional 49,700 tons grading 9.35 troy ounces of Ag per ton. The ore was shipped directly to smelters. The mine was operated by Anaconda from 1929 to 1946 and by a lessee from 1963 to 1975. Several silver, gold and base metal mineralized zones occur as breccia and veins hosted by permeable units of volcaniclastic rocks. The high- sulphidation mineralization is accompanied by silicification of the host rocks. Silver is the metal of primary interest, although the gold and base metals are significant and may provide by- product revenues. The vertical zonation of the mineralization at the Main mine shows an increase in pyrite grain size, copper and gold content with depth suggesting the presence of a porphyry system at depth. Since the production periods at least 722 drill holes for 57,498m meters have been drilled. Currently, the Hog Heaven project does not host a NI-43-101 compliant resource estimate as defined by the CIM Definition Standards for Mineral Resources and Mineral Reserves. Brixton is a Canadian exploration and development company focused on the advancement of its gold and silver projects toward feasibility. Brixton wholly owns four exploration projects, the Thorn gold-silver and the Atlin gold projects located in NWBC, the Langis-Hudson Bay silver- cobalt project in Ontario and the Hog Heaven silver-gold-copper project in NW Montana, USA. The Company is actively seeking JV partners to advance one or more of its projects. Brixton MetalsCorporation shares trade on the TSX-V under the ticker symbol BBB. For more information about Brixton please visit our website at www.brixtonmetals.com. Information set forth in this news release may involve forward-looking statements under applicable securities laws. Forward-looking statements are statements that relate to future, not past, events. In this context, forward-looking statements often address expected future business and financial performance, and often contain words such as "anticipate", "believe", "plan", "estimate", "expect", and "intend", statements that an action or event "may", "might", "could", "should", or "will" be taken or occur, including statements that address potential quantity and/or grade of minerals, potential size and expansion of a mineralized zone, proposed timing of exploration and development plans, or other similar expressions. All statements, other than statements of historical fact included herein including, without limitation, statements regarding the use of proceeds, TSXV final approval, and the exploration potential of the Hog Heaven project based on historical drill results and forward looking statements. By their nature, forward-looking statements involve known and unknown risks, uncertainties and other factors which may cause our actual results, performance or achievements, or other future events, to be materially different from any future results, performance or achievements expressed or implied by such forward-looking statements. Such factors include, among others, the following risks: the need for additional financing; operational risks associated with mineral exploration; fluctuations in commodity prices; title matters; and the additional risks identified in the annual information form of the Company or other reports and filings with the TSXV and applicable Canadian securities regulators. Forward-looking statements are made based on management's beliefs, estimates and opinions on the date that statements are made and the Company undertakes no obligation to update forward looking statements if these beliefs, estimates and opinions or other circumstances should change, except as required by applicable securities laws. Investors are cautioned against attributing undue certainty to forward-looking statements.